Dr. Osama Malhees, Director of Rafidia Hospital in Nablus, demanded PA Chairman Abbas to intervene to protect doctors and government hospital staff from interference of security services' elements in the medical staff's work. Malhees said in a press statement: "The doctors and Rafidia Hospital staff cannot provide health services amid the state of fear caused by the use of violence by some elements of PA security apparatuses," and the interference in the medical affairs by some bodies. He has also urged the officials to stop and deter the interference in the medical affairs, which started causing chaos in the medical institutions. Rafidia Hospital director stressed that the hospital staff have been attacked five times in two months by elements in the Authority apparatuses. He pointed out that the last attack took place two days ago, when Palestinian policemen opened fire inside the hospital and nearly killed one of the doctors, and stressed that the shooting has terrified the doctors and the patients inside the hospital. Dozens of political prisoners' families have participated in a sit-in, in al-Khalil on Saturday, in protest against the escalating campaign of arrests and summonses among liberated prisoners in violation of the court decision to release a number of them. The participants have raised the political detainees' pictures and banners condemning the political arrest policy and security coordination with the occupation. Khalil Assaf, the coordinator of the Public Freedoms Committee in the West Bank, has also participated in the sit-in. The political prisoner in the Jericho prison Kareem Shaheen's mother expressed her condemnation of the blackmail policy practiced by the PA security services against the political prisoners' families to stop them protesting in support of their sons, stressing their determination to continue supporting their sons' issue until their release. For her part, the political prisoner Awad Rajaby's wife wondered about the reason behind the PA security agencies' keenness to defend the occupation security. The mother of former detainee Wissam Qawasmeh denounced the policy of high fines imposed by the Palestinian authority on political prisoners, where many families are forced to borrow money to pay these unjust fines, she said. The participants have marched through the city's main streets, stressing that they will continue their activities despite PA threats and attempts to influence their activities. The Islamic Resistance Movement, Hamas, confirmed that the political prisoner Kareem Shaheen, in the occupied West Bank, was subjected to torture in PA detention centers, where torture has escalated recently against many political detainees, according to the prisoners' families and human rights organizations. Hamas quoted in the report issued in the West Bank on Wednesday evening the liberated prisoner Kareem Shaheen's family as saying that their son detained since February, 25 was subjected to physical torture and beatings, causing him semi-paralysis in his hand due to hanging him by the hands and feet in the air for long hours. The detainee Shaheen's wife confirmed that her husband's hand was semi-paralyzed due to the torture practiced against him, where he received treatment after being released. She expressed her shock when she visited her husband in the Jericho prison last Saturday, where he suffers semi-paralysis in his hand and has chest problems. The report said that the wife's testimony refutes PA allegations that deny torture cases in its jails. The wife expressed concern towards her husband's health situation in light of this difficult detention conditions. The movement's report confirmed that members of the Palestinian intelligence service in al-Khalil have violently stormed and searched the liberated prisoner's house before arresting him. The wife pointed out that her husband has served about 6 years in Israeli jails, noting that despite his bad health condition, he was subjected to torture by PA security services. Shaheen was arrested several times in the PA and Israeli prisons. Israeli Occupation Forces (IOF) arrested at dawn on Thursday two Palestinians released from PA preventive prisons in al-Khalil city, in the southern occupied West Bank. The IOF arrested on Thursday morning the youths Majd Bilal Ahmarw, 18, and Mekdad Banan Ahmarw, 17, after raiding their homes in the city of al-Khalil, PIC reporter revealed. The reporter added that the two Palestinian youths were kidnapped by PA preventive services in addition to 6 other youths in al-Khalil, where they were subjected to severe torture for more than a month during interrogation, under the pretext of appearing in a video posted on YouTube in which they threatened the occupation to avenge the killing of Hamza Salah in the old city of al-Khalil two months ago. PA security services arrested an engineer in Ramallah, transferred a detainee from Tulkarem to Junaid Prison, and continued to detain one of the preachers of the town of Burqin near Jenin, while the occupation summoned a liberated prisoner. PA General Intelligence arrested on Monday evening the liberated prisoner Alaa al-Din Samaha from his workplace in al-Bireh. The engineer Alaa declared hunger strike since the moment of his arrest in protest against his political arrest, his family confirmed. Alaa al-Din Samaha was arrested by the occupying forces, and arrested more than once by the PA security apparatus, he was studying electrical engineering at Birzeit University and graduated a month ago after losing a number of years in occupation Jails. Furthermore, PA preventive security transferred the detainee Mahmoud Freij from Shweikeh suburb in Tulkarem to Junaid prison in Nablus. The preventive service continued to arrest the preacher sheikh Nader Lutfi Massad, 36, from Burqin near Jenin, since about a month ago, no further information was provided about him since his arrest. Massad is a preacher, a father of two daughters, and a brother of two martyrs, he has previously spent seven years in Israeli prisons for belonging to al-Qassam Brigades and he was arrested several times in PA prisons. Massad family called on Liberties Committee to intervene to know her son's fate and to work for his release. In al-Khalil, occupation forces raided at dawn on Sunday the town of Beit Ummar and stormed the house of the liberated prisoner Emad Rosie Sabarneh, 26, and summoned him to Etzion Intelligence center. The liberated prisoner was summoned more than 20 times to the PA intelligence service, and he was detained by the occupation for 20 months. The security services in the West Bank launched an arrest campaign against Hamas movement's members and supporters during February, Hamas Information Center revealed in a statement on Thursday. The statement confirmed that Fatah security services kidnapped 66 of Hamas' supporters and members, including 32 liberated prisoners, 3 university students, a journalist, and a teacher, in addition to summoning 38 others. The statement pointed out that the PA security agencies extended the detention of 10 prisoners despite the Court decision to release them. The report pointed out that the occupation arrested 4 Hamas leaders and supporters of Hamas who were released from PA prisons. The London-based Arab organization for human rights called on UN secretary-general Ban Ki-moon to pressure Palestinian president Mahmoud Abbas to abide by the international law and end the violations committed by his security apparatuses against the West Bank citizens. In a press release, the Arab organization appealed to Ki-moon to remind the Palestinian authority (PA) of its international obligations after Palestine was approved as a UN non-member state. It urged him to pressure the PA, if necessary, to respect and protect the basic human rights of the Palestinians as stipulated by the universal declaration of human rights and Geneva conventions. The organization also called on the Arab League, the organization of Islamic cooperation and the Egyptian sponsor of the Palestinian reconciliation talks to take action in this regard to force the PA to respect the rights of its citizens. The Arab organization for human rights had issued last December a report illustrating the violations that are committed by the PA security apparatuses in the West Bank. Its report underlined that the PA security forces carry out extrajudicial arrests and torture detainees in its jails in coordination with its Israeli security counterparts and under Euro-American auspices. Israeli occupation forces (IOF) arrested 30 Palestinian citizens in the West Bank in February after they were released from PA authority jails. A statistics report by the West Bank Pulse website (Omama) on Tuesday documented the names of all those detainees who included Hamas leaders and university students. It pointed out that 14 of those were from Nablus, five from Al-Khalil, five from Tulkarem, three from Ramallah and three from Qalqilia. Abdel-Ghani al-Awiwi, the PA Attorney General, ordered an investigation into the death of a prisoner in the PA jail in Jericho. Ayman Samarah (40), who hails from Jenin but lived in Jericho, died Friday afternoon in Jericho hospital after being transferred to hospital from Jericho’s central jail. He was detained by a court order from Jericho magistrate court on 28 February accused of causing harm. In a statement by the Attorney General’s office, the Attorney General said that he visited the hospital and checked the body of the deceased in company of the resident doctor and informed his family. He added that initial investigations suggest that the deceased was suffering from diabetes and high blood pressure and that he has a medical record at the hospital in Jericho where he was being treated. The Attorney General ordered a post-mortem. One of the leaders of Islamic Jihad and his brother, detained in the Palestinian Authority's jails, announced entering a hunger strike until their release. The leader Ayman Tabich, 32, and his brother Khalid, from Dura in al-Khalil in the southern occupied West Bank, were arrested on Sunday evening by PA intelligence service and were transferred to an unknown destination. The Islamic Jihad movement said in a statement that leader Tabich and his brother announced a hunger strike in protest at the continuation of the administrative detention. Activist in the Islamic Resistance Movement Tariq Addis, 30 from the city of al-Khalil, has been also detained in Palestinian intelligence detention center in Jericho for fifty days. Addis is a liberated prisoner who served more than six years in Israeli jails. He was also arrested and summoned many times by PA apparatuses. The Palestinian court ruled the release of Tariq on the 17th of January 2013, but the security services did not apply this decision. Tariq’s wife condemned the continuation of the detention of her husband and demanded the immediate release of all political detainees in the Authority’s prisons. For his part; Dr. Aziz Dweik, the speaker of the Palestinian Legislative Council warned of the continuation of the policy of political detention and security summons against Hamas activists, considering it obstacle to the reconciliation, and demanded the Egyptian sponsor of the reconciliation to intervene to end the this file. Dr. Dweik told PIC that there are some parties in the Authority, including the security services, which do not want the reconciliation to succeed. Meanwhile, the Preventive Security Service arrested in Nablus on Tuesday evening journalist Mohamed Awad, after raiding his workplace in the city, and took him to an unknown destination, eyewitnesses told PIC's reporter. . "
Awad announced that he will go on an open-ended hunger strike until his release. Islamic Jihad movement said that force from the PA's intelligence service arrested on Sunday night one of the movement leaders Engineer Ayman Tabich, 32, and his brother Khalid, from the town of Dura in al-Khalil in the southern occupied West Bank, and took them to an unknown destination. Jihad movement said in a statement on Monday that it is considering this act as gravely dangerous as it is against the national interest. It also held the Authority security apparatus fully responsible for the safety of leader Tabich and his brother, and demanded their immediate release. The movement expressed surprise at the security services' insistence on continuing the political arrests, despite the positive atmosphere brought about by the national reconciliation process. "The continuation of political arrests deepens the reality of division", the movement said, adding that this policy must be stopped "if we really want to open a new page based on achieving national reconciliation on the ground." For its part; Hamas has recently revealed that the File of freedoms in the occupied West Bank is the real obstacle facing the completion of the national reconciliation, and that the continuation of political arrests in the West Bank is unjustified and against the national interest. Political analyst Wissam Afifa told PIC's reporter that the Authority has been trying to justify the political arrests against all those who adopt resistance to defend their homeland through claiming that resistance harms the Palestinian cause. He added: "If this is the approach adopted by the Authority, then all the leaders of the Palestinian struggle must be arrested," pointing out that the arrests in the West Bank will hamper the achievement of reconciliation. Political analyst Hassan Abdou told PIC's reporter that these arrests represent a real obstacle to reconciliation, and come under arrangements with the occupation. "These detentions are not expected to be stopped in light of the security coordination," he added. Preventive Security Service arrested a former political detainee and liberated prisoner from Qalqilya, while the General Intelligence Service arrested a young man from Hamas supporters in Nablus. The Preventive apparatus has also summoned a young man from Ramallah on Monday to its security headquarters. A delegation of Palestinian MPs in the West Bank met on Wednesday evening representatives of the Independent Commission for Human Rights (ICHR), in the MPs office in Ramallah, in the center of the West Bank. The MPs hailed the ICHR for the "efforts and work" carried out by the organization in several issues, as its achievement in the case of the teachers dismissed from the civil service in the cities of the West Bank. The delegation of the MPs demanded, during the meeting with representatives of the Commission, the ICHR to reject the ongoing violations of liberties in the West Bank and to take the initiative to stop those responsible for these violations. At the end of the meeting, the Palestinian deputies thanked the Independent Commission for the efforts it has been making in the fight against the violation of freedoms in the West Bank. Deputy head of Hamas's political bureau Mousa Abu Marzouk said the arrest campaigns that are waged by both the Palestinian authority and Israel against Hamas cadres and supporters in the context of their security cooperation do not create the atmosphere for the holding of fair and free elections in the West Bank. "This matter vindicates the impossibility of holding elections under occupation, and this makes the Palestinian authority (PA) particularly responsible for ensuring the freedom of political action and reconsidering its measures and accusations against others," Abu Marzouk underlined in a press statement to the Palestinian information center (PIC). Abu Marzouk stated that Israel's arrest of Hamas lawmakers and leaders during the Palestinian reconciliation talks in Cairo was an obvious message against the national dialog. "The size of the Zionist arrests and those carried out by the PA apparatuses does not imply that the atmosphere is ripe for holding elections soon," the Hamas official stressed. "The elections cannot take place without creating the atmosphere in the West Bank, ensuring freedom of expression, electoral propaganda, meetings, seminars, allowing others to explain their political platforms and positions freely and providing freedom of movement, registration and voting; how, without such essentials, can we hold free and fair elections?, he said. In a related context, member of Hamas's political bureau Mahmoud Al-Zahhar said there are internal and external parties do not want the Palestinian rivals to end the division in the Palestinian arena and they work on thwarting the national reconciliation. Making his remarks in a political symposium on Tuesday, Zahhar stated that his Movement wants to achieve the Palestinian reconciliation in order to unleash the resistance in the West Bank. He affirmed that Hamas would never give up its political platform or the achievements it had made over the past years. Inhabitants in Qarawat Bani Zeid village, west of Ramallah, prevented PA security agents from arresting the wife of political detainee Ibrahim Sanif. Eyewitnesses told the PIC that elements of the preventive security apparatus interrogated the wife after breaking into her house on Sunday and tried to take her away. They said that family members and angry inhabitants who gathered at the scene prevented the security men from arresting the wife. PA security men stormed three other nearby villages at the same time and broke into and ransacked many homes. The Euro-mid observer for human rights expressed its grave concern about the serious violations committed by the Palestinian authority (PA) security forces against the freedom of the press and expression in the West Bank, calling for reconsidering the European support for the PA. In a press release on Saturday, the Euro-mid observer denounced the PA preventive security forces for raiding the house of journalist Mohamed Awad in Budrus village near Ramallah city a few days ago. The human rights group affirmed that the PA security forces did not produce a search warrant allowing them to storm the house, which makes such action illegal. Awad, who works for Ramsat news agency, told the Euro-mid observer that he had been detained last year for three weeks by the PA intelligence apparatus without judicial authorization and was summoned many times. He added that the PA intelligence forces had already stormed and ransacked his house and blackmailed him into cooperating with their agency. The observer also noted that a PA court in Nablus city ordered the detention of facebook activist Anas Awad for one year on a charge of insulting the upper echelons of the PA on his page. It stressed that Awad practiced his right to freedom of expression according to international law and did not make any offense requiring his trial. The Euro-mid observer called on the PA to end its restrictions on public freedoms and all kinds of arrests and summonses without judicial warrants. It also appealed to the European union and the donor countries to re-evaluate their unconditional support for the PA security system, in light of the serious violation of human rights in the West Bank. Political prisoner Khalil Mahfouz, 29, said he has been on hunger strike for four days in protest at his detention without any guilt by the Palestinian authority preventive security apparatus. Mahfouz was kidnapped last Thursday as he was leaving a mosque in Nablus city and taken in chain to Juneid jail. He had been jailed several times before by the PA security apparatuses, and the Israeli occupation forces (IOF) also kidnapped him about seven months ago only a few days after his release from a PA jail. Later, the IOF released him along with his brother on December 10, 2012 after he spent six months in jail. His family stated that the health condition of Mahfouz does not allow him to go on hunger strike and appealed to human rights groups and the Palestinian freedoms committee to intervene to have him released. A Palestinian prisoner held at the detention center run by the Palestinian Police in the Gaza Strip died, on Friday morning after he was moved to the Intensive care unit at the Al-Shifa hospital in Gaza city. The prisoner, Mahrous Fathi Nassar, 37, contracted Meningitis while being held at the Sheikh Radwan Prison. He was arrested on January 31, 2013, after a local court ordered his imprisonment for 15 days for interrogation. He was moved to the Al-Shifa hospital on Thursday morning after his body temperature has seriously elevated and after he started throwing up. Two Palestinian fighters of the Al-Quds Brigades, the armed wing of the Islamic Jihad, have been injured during clashes that took place, Saturday, with members of the Al-Qassam Brigades of Hamas, and members of the Hamas-run security forces of the Interior Ministry in Gaza. 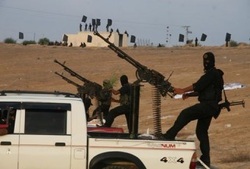 Eyewitnesses reported that members of the Al-Quds Brigades established a training area in the former Israeli settlement of Nitzarim, south of Gaza city, and clashed with security forces and members of the Al-Qassam bridges who tried to remove them. The clashes were relatively brief; the two wounded Palestinians suffered moderate injuries. Medical sources reported that one resident was also injured when his motorcycle crashed into a jeep driven by members of the Al-Quds Brigades. Also, dozens of security officers were deployed in the Salah Ed-Deen Street, between Az-Zeitoun neighborhood in Gaza, and Khan Younis, in the southern part of the coastal region. They stopped and searched several vehicles in an attempt to prevent more gunmen from heading to the area where the clashes took place.